The VWR Flammable Storage Undercounter Freezer can be placed just about anywhere in your lab that you need. This specialty purpose lab freezer can be stashed under a counter, on top of a bench or tucked away in a corner, so long as there is 4 inches in the back and 3 inches on the side of clearance for proper air flow. Temperature for this 4 cu ft capacity undercounter freezer is controlled by the dial thermostat at the rear of the freezer and no electrical components are inside. The interior of this lab freezer is set with 2 fixed shelves and a removable tray to contain any spills that may occur. 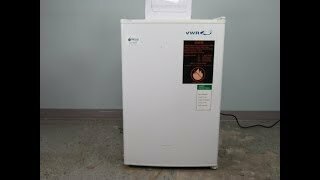 This VWR Undercounter Freezer has been thoroughly tested and comes with current temperature validations. All of our lab equipment comes backed with our standard warranty. Should you have any questions, please don't hesitat to contact us.